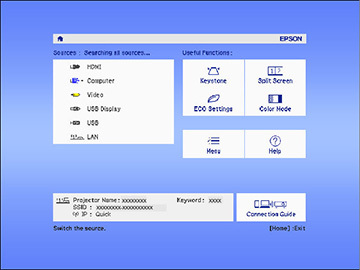 Note: If you turned on the Auto Source Search setting in the Extended menu, the projector automatically switches to another detected image source if the signal to the current image source is lost. 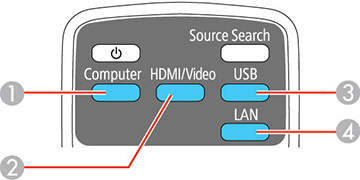 Press the Source Search button on the projector or remote control until you see the image from the source you want. Press the Home button on the remote control or projector and select your image source. Note: Your Home screen may look different from the illustration shown here.